Eat like your ancestors and live longer! Paleo Diet – a life style or just another diet? For the past couple of years, everyone in the fitness industry has been talking about the Paleo diet. It’s fair to claim that it’s one of the hottest diet trends of all time. Everyone seems to be on it, including major A list celebrities such as Gwyneth Paltrow, Megan Fox and Matthew McConaughey. So what exactly are we talking about here and can anyone do it? Some people call it the Caveman diet, “If a Caveman didn’t eat it, then you shouldn’t either”. Its followers swear it’s a way of life and not a temporary fix, which the word ‘diet’ indicates. Unlike complicated fad diets or tedious calorie-counting programs, the Paleo diet founded by Dr. Loren Cardain, takes things back to basics. The idea of it is by reverting back to eating foods that are unprocessed, the body responds positively and weight drops. Tens of thousands of years ago, before we even knew what crisps, chocolate bars and fast food outlets were, our Stone Age ancestors thrived and flourished on a nutrient-dense diet of meat, fish, fruits, vegetables and healthy fats from nuts and seed, all without the added hormones used to stimulate growth. This meant they had a diet that was devoid of grains, dairy, sugar, alcohol or any processed or refined foods. So the idea of Paleo is, that by adopting an ancestral pre-agricultural diet, we cut down on the main diseases of modern day civilization: obesity. Eat: Meat, fish, eggs, vegetables, fruits, nuts, seeds and healthy fats and oils. Lean proteins support strong muscles, healthy bones, as well as optimal immune function, PLUS you feel satisfied between meals. Fruit and vegetables are rich/high in antioxidants, vitamins and minerals and have been shown to decrease the possibility of people developing degenerate illnesses including, diabetes and cancer. Research suggests that diets rich in monounsaturated and omega-3 fats have significant reductions in cases of obesity, diabetes, cancer and heart disease. Stay away from: Processed foods and sugars, this includes fizzy soft drinks, grains, most dairy, legumes (beans and lentils), vegetable oil, margarines, artificial additives, sweeteners and trans fats. Drink: Water! It’s that simple and should be the beverage of choice. Special treats: For those that have a sweet tooth or like to have an alcoholic drink on occasions, you could try a good quality red wine as this would be high in antioxidants, as would dark chocolate, choose one that has 70% or higher cocoa content as this would be healthier for you and is very nutritious. Snacks: Hard-boiled egg, a handful of nuts, baby carrots, a piece of fruit, some mixed berries. You may wonder what’s wrong with grains and legumes. Believe it or not, but both are low in nutritional values. Grains are lousy sources of fiber, minerals and vitamin B when compared to meats, seafood, fresh fruit and vegetables. Our ancestors didn’t eat grains the way we do today. Our diet consists of mainly grains, even the cattle are being fed grains, which they can’t digest, and neither can we. Grain intolerance is tied to numerous diseases. Not to forget, grains and legumes are high in lectin proteins, which inhibit your gastrointestinal tract to repair itself. Eggs and vegetables, fried in coconut oil, plus one piece of fruit. Bacon and eggs, with one piece of fruit. Sandwich in a lettuce leaf, some meat and fresh vegetables. Ground beef stir fry with vegetables and a handful of nuts. Chicken salad with olive oil, plus a handful of nuts. Salmon, fried in butter with vegetables. Burgers (no bun), fried in butter, with vegetables and some salsa. Steak with vegetables and sweet potatoes. 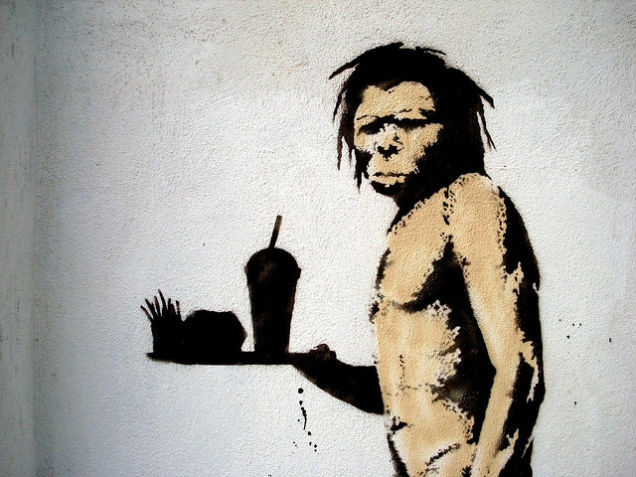 There is an entire world of information out there on Paleo and what to eat. Just do a Google search on “Paleo diet” or “Paleo eating plan” and you will be surprised at what you will find.